When you first came into our lives you entered in at a time of hurt and pain. We were all hurting and in different ways. We all took some blame for the marriage breakdown even if we didn’t admit it then. We were quick to speak and quick to hurt in the cruellest way possible. Every movement of the tongue was full of hatred and all because we wanted the other person to hurt as much as we were hurting. Yet, through all of the pain you were still there. You stayed through the times the compromises failed, past the police visits and the divorce solicitors and government bodies. You kept everything together when family started interfering and friends were stirring trouble. You saw the hurt that was being caused but only from one side. You heard the vicious and unnecessary things that I was saying; you saw someone that you were falling in love with being attacked and trying their best to still function and be a mum and yet still stayed. You stayed and you supported both her and the boys despite walking into a warzone. I admit that I hated you at first. You were spending time with my children and became the man of the house. This was my role and I took your presence as a sign that I was no longer needed. I felt that you muscled your way in, fulfilled a role in my family that I couldn’t and worst that you did it better than I could. It hurt to hear stories of happiness and fun. How the boys enjoyed the different things that you would do and how Mummy found something funny or importantly how happy she was. It hurt when I heard the boys, through their understanding of the situation, call you daddy. It hurt to hear stories about how you could do things with the boys that I couldn’t. How you could throw them into the air and catch them or how they rode on your shoulders in a crowd. How was I meant to compete with that? I was jealous and hurt and I struggled to see past all of it. I saw everything through envious eyes that were tinted with agonising pain that I was losing my family to you. It took us all time to finally move past so much and to head back into the right direction that focused on the boys and our own lives. Yet, you still stayed. You provided stability to the boys in times where both their mum and I couldn’t. You provided happiness and laughter to a world that was gloomy. Importantly, you became an example of what a man and a dad could be when I forgot. Over the last few years I have seen you face the same hard parenting road that I have. I have seen you have to fight a wiggling child to put their shoes on, try to calm a tantrum, have to take a fourth trip into the house because you have forgotten what seems the most “crucial” item for the boys. You have helped to feed them, clothe them and financially support them and their mum. You have taken your time to play, educate, collect them for clubs and activities and still put on a smile in the hardest moments. Parenting is defined as the process of promoting and supporting the physical, emotional, social and intellectual development of a child from infancy to adulthood. Parenting refers us to all of these aspects of raising a child aside from the biological relationship. You are, in all sense of the word, a dad to them both. I may always be their Daddy but you are also their parent. 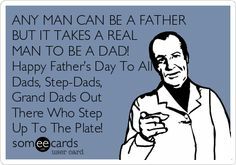 I will be spending the day celebrating Father’s day with them and I hope you equally enjoy the day as you have shown that it takes a good man to take on someone else’s children and treat them as your own. I will always appreciate you being in their lives.